Heat the oil in a saucepan over medium-low heat. Cook the onion for 3 minutes or until soft. Stir in combined capsicum, ginger, garlic and half the chilli for 3 minutes or until aromatic. Stir in tomato for 5 minutes or until soft. Stir in coconut milk and stock. Bring to the boil. Reduce heat to low. Add the fish and simmer for 2-3 minutes. Add the prawns and simmer for 3-4 minutes or until cooked. Stir in chopped coriander, lime juice and half the shallot. Top with the coriander leaves, and the remaining chilli and shallot. def: Gnocchi with Green Peas - a delicious and memorable Italian pasta cuisine. Bake the potatoes in their skins for 1-1¼ hours until tender, then remove the flesh and mash until smooth. Mix in the ricotta, a pinch of salt and pepper and the flour. Cut the dough in half and shape each piece into a long cigar, about 1.5cm thick. Using the back of a floured table knife, cut each length into 2cm pieces to make the gnocchi. 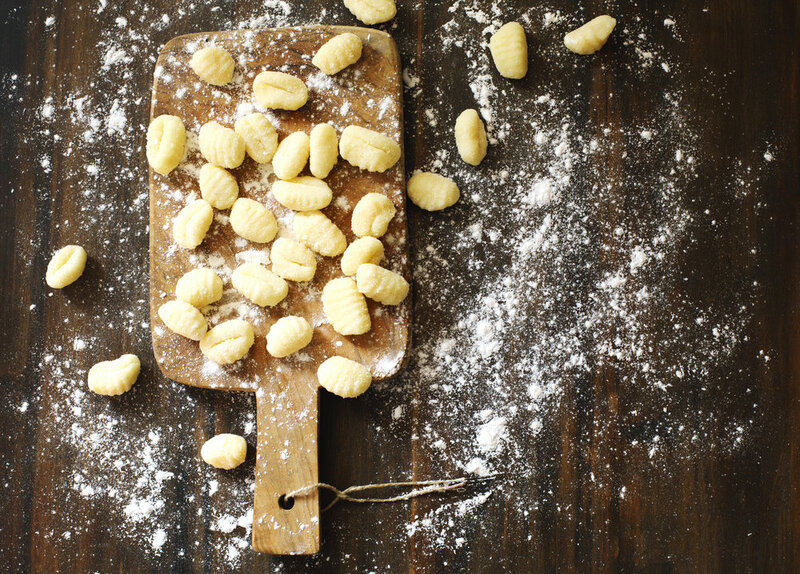 Gently make a dent in each one – it will allow the gnocchi to hold more sauce. Add the gnocchi to a large pan of boiling water, tilting it from side to side briefly to stop them sticking together. Simmer for 1½-2 minutes, until they start to float. Drain and leave the gnocchi to dry for 1-2 minutes. Heat a frying pan over a medium-high heat and add a little olive oil. Add the gnocchi to the pan with a pinch of salt and black pepper and sauté for 1-2 minutes on each side until coloured. Add the peas, butter and thyme leaves. Toss, then add the lemon zest. def: Soupe a l'oignon - a traditional French soup originated from Paris in the XVIII century. Caramelize the onions in a large fry pan over medium heat, melt butter with a little of the olive oil, add the onions and cook stirring occasionally until golden. Reduce heat; add sugar and salt stirring until the onions are caramelized for about 25 min. In another saucepan bring the stock and wine to the boil, slowly add the stock mixture to the onion mix. Reduce heat and let simmer for 45 min until onions start to break down and melt into broth. Preheat a grill or Broiler. On a baking tray, place sliced bread and drizzle with olive oil. Grill till golden, rub bread with garlic. Using an oven proof soup dish, ladle soup into dish, top with slices of bread, sprinkle with grated cheese and bake until cheese is golden. def: BOUILLABAISSE - a rich, spicy stew or soup made with various kinds of fish, originally from Provence. Recipe also available on RecipeYum. To make the soup, warm olive oil in heavy-bottomed saucepan over medium-high heat. Add onions and leeks and sauté for 2-3 minutes until translucent. Add tomatoes, garlic, bay leaf, thyme, fennel, orange zest, salt and pepper and stir to combine. Add wine, water and potatoes. Bring to boil, reduce heat to low, cover and simmer until potatoes are tender (approx 25min). Once the potatoes are tender, bring the mixture back to the boil and add the saffron. Lay firm-flesh fish on top and pour over just enough boiling water to cover. Boil for 7 minutes until fish half cooked. Add tender-flesh fish, mussels and crabs. Discard any mussels that do not close when touched. Add more boiling water as needed to cover and boil for 3-4 minutes. Tender fish should separate easily with a fork and mussels open. 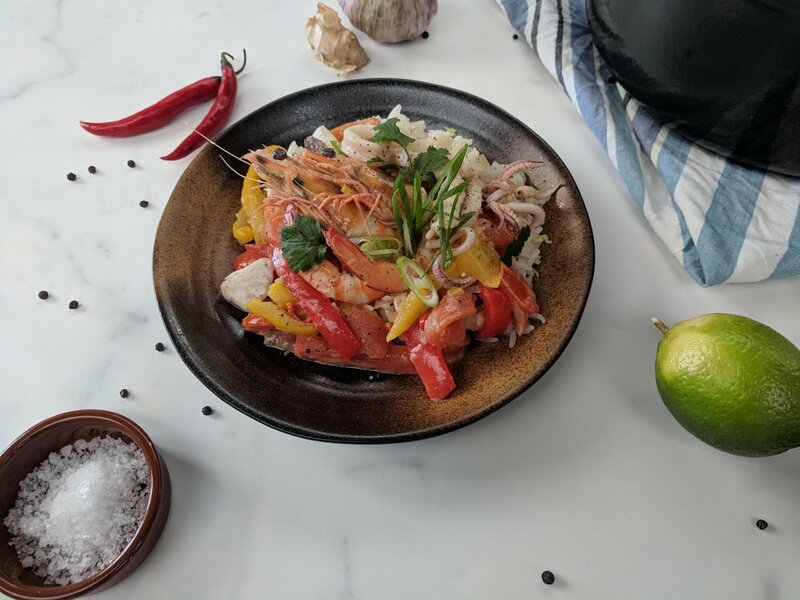 Using a spatula, transfer fish and shellfish to a warmed platter, placing tender fish to one side, firm fish to the other. Discard any mussels that have not opened. Using a slotted spoon, transfer the potatoes to the same plate. Ladle a few tablespoons of broth over the seafood and sprinkle with parsley. Place bread slice in the bottom of each serving bowl, top with seafood and potatoes and remaining broth. Bring a large saucepan of salted water to boil over high heat. Add macaroni and cook, stirring occasionally until not quite al dente (approx 2 minutes less than the packet instructions). Drain and transfer to a large bowl. Return saucepan to medium-high heat and melt 100g butter. Add flour and mustard and cook, stirring well until no visible flour remains (approx 1-3 minutes). Whisk in milk and cream and bring to boil. Simmer, whisking frequently for 4-5 minutes until smooth. Remove from heat. Add a pinch of pepper, crab meat and cheddar. Pour macaroni into the cheese sauce, add chives and stir well. Transfer to prepared baking dish and top with remaining cheeses. Bake until the top is lightly browned and the sauce is bubbly (approx 25-30 minutes). Stand for 5 minutes before serving. We recommend consumption in front of the fireplace accompanied by a warming glass of pinot! Place all ingredients except pork in a cast iron pot or slow cooker on high heat and combine. Add the pork and bring to the boil. Lower heat and simmer, stirring occasionally, for 1½ - 2 hours or until the pork is tender and falling apart. At this point the liquid should be thick and syrupy. If the liquid hasn't evaporated enough, transfer the pork to a bowl and reduce until it has reached a sticky consistency, then strain through a fine mesh sieve and reserve. Pull the pork apart with a fork (or with your fingers) and pour over the reduced cooking liquid. Heat lard or olive oil in a cast iron skillet or heavy bottom frying pan and fry the pork for 10-15 minutes. It is best not to stir too much so that the bottom goes a golden crispy brown and the top stays moist and tender. Be careful not to burn the base. Stir the meat around and serve immediately with the Mexican Beans. A perfect, cool-weather Autumn feast! This beautiful braise would also be a fantastic filling for tacos or fajitas. Place the peeled garlic cloves in a pot of cold water and bring to the boil. Once soft, place in a colander, refresh with iced water and set aside. Place the butter, shallots and garlic in a food processor and blend until smooth. Transfer to a bowl, add chopped parsley and cover with cling wrap. Preheat your grilled pan or BBQ to medium/high. Take the head off of each prawn and carefully butterfly them from the back with a sharp paring knife. Drizzle the prawns with olive oil, salt & pepper. Place them onto the grill shell side down and cook for a minute or until slightly charred, then flip over to the other side for another minute. Remove the garlic butter from the fridge, heat in a small pan until foaming and pour over the prawns. Serve straight away. Simply delicious! Heat the fat in a large fry pan over high heat. Brown beef cheeks on both sides and set aside. De-glaze the pan with some water and add glaze to pressure cooker or slow-cooker with beef cheeks, broth, onion, garlic, honey and spices. Top up with water until all ingredients are covered and stir to combine. Cook for 90 minutes (pressure cooker) or 5-6 hours (slow cooker) until meat is tender and falling apart. Remove from heat. To prepare the veggies, pre-heat the oven to 190 degrees. In a bowl combine the brussels sprouts with the coconut oil, place on tray lined with baking paper and season. Cook for 25-30 minutes or until soft in the centre with crisp outer leaves. Remove from heat and set aside. In a saucepan, cover sweet potato with salted water and bring to the boil. Reduce the heat and allow to simmer until soft. Drain and return to the heat for 60 seconds to remove remaining liquid. Mash together with butter, mustard and seasoning. Reduce the liquid from the cheeks in a frying pan over high heat until thick and sticky. Serve with beef, mash and crispy brussels sprouts. Enjoy!